Ads which pop-up in any manner have long been considered pretty toxic - whether pop-over, pop-under - new tab etc. Any variation of this is now blocked by the ’Chrome Filter’. These are the heirs of the splash screen of old, sometimes called take-over ads, and can be of either the static or video / animated variety. Anything which lingers unprompted in such a manner is screened out. These are ads which automatically start playing with full volume as soon as you hit the page, I can recall seeing lots of these on the Designboom site at one stage - again, most annoying for users and now screened out by the Chrome Filter. 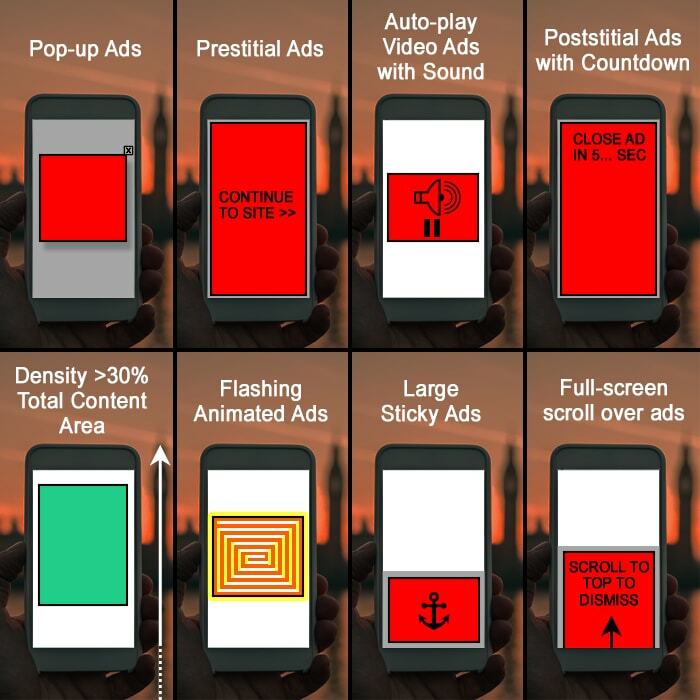 These are ads which typically lock themselves to the top or bottom of your screen and sit on top of the content - these occasionally have delayed shut-down too, but generally users and now Google don’t like these if they exceed 30% of the total screen real-estate. Same as for desktop and a lot more fiddly to shut down on mobiles. Now screened out by the Google Filter. Classic take-over / splash screen ads which impose themselves on the user and cannot be easily navigated around. Same again for desktop - video ads starting by themselves and at full volume - Google will screen these out. Sort of screen take-over ads which force you to withness the ad for a set period - usually 5-30 seconds. This one took me the longest to understand. It actually means the total proportion of ad real-estate as a proportion of the height of the entire main content area. In Affino terms this means everything within the Prime Content Area - and all the Ads together (campaign placements) which occupy that space cannot amount to more than 30% of the height of the total prime content area! I'm frankly still surprised I see these - but there are still some of these around which fight for attention by being as destracting as they possibly can - a little like an annoying neighbour who keeps leaning on his car horn. Same as per desktop - anything occupying more than 30% of the total screen real-estate, which differs significantly from the 'Density' rule which is as a proportion of the entire content real-estate. These can appear in a number of ways - sometimes they look like they are scrolling above the content, and sometimes through an expanded slot beneath, but the mechanism is the same - you are compelled to scroll through the full screen ad and cannot avoid it by other means. Which I recommend viewing if you are still confused. Next: Musical Alphabetti Spaghetti - Songs! Publisher Revenue Streams - Are Freemium Gateways still a viable option?